Just tuning in? Please start at the Original Post of this Series on “Surviving Infidelity”: Shattered Hearts, Broken Promises. This is Post 2 for today, be sure to head back one post to The Death of Little Girl Dreams. I want to share an old folktale with you, which illustrates God’s view of our brokenness……. After two years of what it perceived to be a bitter failure, it spoke to the water bearer one day by the stream. “I am ashamed of myself, and I want to apologize to you. I have been able to deliver only half my load because this crack in my side causes water to leak out all the way back to your house. Because of my flaws, you have to do all of this work, and you don’t get full value from your efforts,” the pot said. 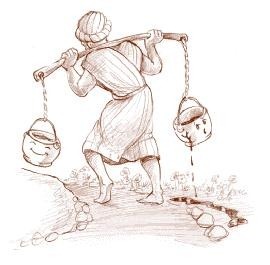 Moral of the story: We’re all cracked pots, but nothing goes to waste in God’s great economy. He uses our flaws for HIS glory. So don’t be afraid of your flaws, for there is beauty to be found in your weakness. May this broken vessel be used for His glory…. That is such a GREAT story! I had never heard that before. I really like it a LOT! Your post were both so good. I always remember David too! All the things that he did in his life and God still loved him. It always amazes me how much love God has for us all. He loves us thru all of our fault.We are reading thru the kids bible with them in the mornings and we are reading about the Isrealites.They walked away from God so many times and he would always come back and help them.If it were me I would have left them a LONG time ago! :) But God is an Awsome God and he is always right there to pick us up and carry us thru the parts of our life that we just can’t walk. It is amazing the changes in my husbands life since he came out and told me all that he had been holding in for so long. He is so much more attentive to me and my needs now. I feel so much closer to him now. I have been thru the”why is my life not going the way I planned it to go”.I have been realizing these past few weeks that I have the feelings for him that I used to have when we were engaged. I have wanted to be that in LOVE with him for so long and now it feels so good to be back to US again. We(I) are/am still working thru our issuse,but we have come a long ways since then. Love this illustration! The story will definitely stick with me. That is a beautiful folktale and a lovely reminder :). I had never heard that story before and I absolutely Love it! Thank you so much for all you share you have really been working on my heart. I love how he found a purpose in the cracks in his life. I have experienced this as well and its why Jeremiah 29:11 is a special verse for me. I know the Lord had GOOD plans for me 9 1/2 years ago!